One of my favorite movies of the last 20 years is Master and Commander: The Far Side of the World, which came out when I was 20 and stunned me with its dramatic perfection and utter awesomeness. I didn’t know then how much it owed to The Bounty, a film that came out a year after I was born and which I had never seen, despite its amazing cast and my fascination with British history. Peter Weir’s swashbuckling tale is an action-packed version of this classic nautical adventure, the two sharing many similarities, and credit should be given where credit is due; obviously Master and Commander owes much to The Bounty and, I’m sure, many other high-seas dramas before it. But here’s one that stands as a pillar of the genre and remains to this day an excellent depiction of life and death on board a vessel that sails under the auspicious union jack. On a voyage to circumnavigate the globe and deliver exotic plants to islands throughout the world’s oceans, Captain William Bligh faced many dangers, including the weapons held in the hands of his very own crewmen. Bligh’s aim was Tahiti, where he would sail the Bounty, extract precious fruit plants, and deliver them to other islands, spreading cheap food through the British Empire in aid of his king. His first mate on this journey was John Fryer, his master’s mate a lifelong friend named Fletcher Christian, both men being strong and able, loyal and brave. The journey would be difficult and the treatment of the crew at times harsh, but the Bounty would reach its goal in Tahiti, meeting with the natives and taking a much-needed rest, but that’s also where the trouble began. Pushed hard by their captain, the men leapt at the opportunity to furlough in an island nation, to rest on the sand, and to meet the local women. Many men even married or impregnated these young girls, creating ties that were hard to break when it was finally time to leave. Realizing that the crew had grown soft, Bligh became harder on them then ever, demanding extra work on deck and blind belief in his navigational skills, to the point that the men began to think about taking the ship into their own hands, and then turning it right back around to Tahiti where easier lives awaited them. So began the most famous mutiny in British naval history, with Bligh’s loyalists facing off against Christian’s rebels, with all their fates in the balance. I’m glad I finally got around to watching this film, because now I see how impactful it has been, how much it set the standard for what was to come later. I’m sure it mirrors others, which mirror books, and back and back and back, but I’m glad I can now appreciate how this movies shaped one of my favorites, because you should always know the history when possible. And speaking of, this is a true story, this really happened, there’s an island nation out in the middle of nowhere whose population is made up of the descendants of the survivors of the mutiny, which is pretty incredible, like something out of a Kurt Vonnegut novel. This disaster remains as an example of how not to conduct your authority, and also as a warning that the hearts of men are easily moved in directions you never thought possible. The film itself boasts one of the strongest casts you’ll ever see, at least on paper, if not exactly at a time in each actor’s career that represents their very best. Anthony Hopkins, Mel Gibson, Liam Neeson, Daniel Day-Lewis, and Laurence Olivier, not to mention Edward Fox, Bernard Hill, and Dexter Fletcher. That’s pretty impressive, although some of the accents aren’t, but the team as a whole came together well, because of course they did. Surprisingly, the film wasn’t nominated for any Academy Awards, but has turned into a classic since, so you never know how the years are going to change the perception, even if the details stay the same. The cinematography is great, the boat scenes will capture audiences, and there’s even a love story that pulls its weight, so really the movie has it all, if never quite becoming perfect enough in any one area for us to call it a masterpiece. Video – With an aspect ratio of 2.35:1 (1920x1080p) and shot using JDC cameras and lenses, the video quality of the film is decent given the year, and above average when compared to other 80s flicks. 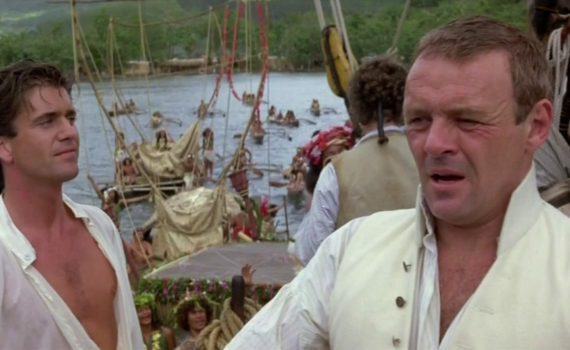 The sea, the ship, the islands, the natives; it’s all captured with as much clarity as can be expected, and has transferred well to a modern Blu-ray disc. Audio – The Blu-ray was done in English 5.1, with an option of English stereo. Subtitles are only available in English, and can be turned on in the disc menu. The audio is fine as well, for the era, but is haunted by a terrible, probably original, song that plays before and after the movie, 80s pop nonsense that has no place alongside this period piece. Extras – There are only a few special features on the Blu-ray, including two types of commentary: one by the crew of the film and one by a historical consultant. Also, four trailers are available for view: The Bounty, The Scarlett Letter, The Crucible, Flesh+Blood. Highly Recommended. The Bounty is better than its overlooked status from 35 years ago, and has since been noticed for what it offers. It perhaps isn’t quite great enough to be called a classic or an icon, but I found, even watching it for the first time all these years after its original release, that it’s solid enough to have been a foundation, which is seriously important work. The true story, the naval culture, the British Empire, the struggle between civility and our baser nature; there is a lot to talk about when looking back at this film, and I’m glad I got the chance to appreciate the layers that it is composed of. The video is nice for its birth year, the audio the same, the bonus features are a bit lacking, so the technical aspects are a bit of a mixed bag, which is no more than you would expect. But the project as a whole is worth our notice, and if you, like me, missed The Bounty over the passing years, it might be time to remedy that.